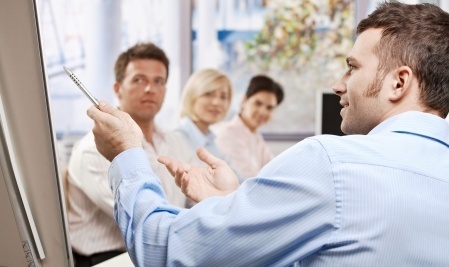 When was the last time your employees went through a training program? Was it when they were first hired? Think about those questions. Do you like the answer? If the answer is "no" how do you go about changing that? Seminars, workshops, and classes are good options, but they can be costly. Especially if there is travel involved. Webinars can also be a good source to further your team's training. 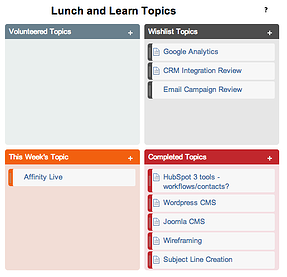 HubSpot hosts a lot of great webinars that members of our team regularly sit in on. However, have you considered looking within your organization to train others? For the past few months we've been holding a weekly book club during lunch. In the week prior to the book club meeting, we would read a chapter in a book relating to our field (online marketing in our case) and discuss it during the meeting time. Book Club, for us, was a time for us to get together and not only learn how to improve our skills, but also improve our company and create or modify policies and procedures. After a few books, we decided to modify our book club meeting. LyntonWeb is a full service agency. We have development, design, marketing and client services teams. While our teams work together very closely, each person has their own area of expertise and backgrounds. We can all learn from one an another, and that is why we decided to modify our book club into a lunch and learn format. Some of our team members came to LyntonWeb with backgrounds in radio, sales, video production, and other vastly different backgrounds. Our clients come from similiar backgrounds and team members can pitch in and help out on projects in areas that we may not have known to ask about previously. Inviting our entire team to these learning and teaching sessions allows each team to better understand the hows and whys of what the other teams do leading to better collaboration, and better results. We have a board on our internal wiki where team members can request topics to be covered, or volunteer topics to present. When HubSpot 3 rolled out our marketing team was on top of the changes and new tools. They had the expertise to show the rest of our team how the new tools worked, and get every one on the same skill level. We record every meeting and post it on our Wiki so they can be reviewed, and so team members who couldn't attend the scheduled metting can participate. These recordings also offer our incoming team members a much wider knowledge base to help ease them into LyntonWeb.